This gyAnam (explained in previous SlOkam) instead of remaining available only for a select few and to make it available for everyone, he compiled dhrAvida brahma samhithA (thiruvAimozhi in divine thamizh), added fragrance with his devotion which was blessed by emperumAn himself as said in thiruvAimozhi 1.1.1 “mayarvaRa madhi nalam aruLinan” (bhagavAn blessed me with faultless knowledge and devotion) with his enchanting compassion-dripping words which will even melt trees as said in thiruvAimozhi 6.5.9 “marangaLum irangum vagai“. nAthamunigaL acquired this knowledge by the grace of nammAzhwAr‘s divine feet. nammAzhwAr too is greatly attached to krishNa’s qualities like nAthamunigaL and SrI parASara bhagavAn. This can be understood by his own words in thiruvAimozhi 1.3.1 “eththiRam” (How is this possible that the supreme lord is in this form of a little boy?! ), thiruvAimozhi 5.10.3 “neyyuN vArthaiyuL annai kOl koLLa” (as soon as mother yaSOdhA hears the butter-theft of krishNa, she will pick up the cane to punish him) and thiruvAimozhi 6.7.1 “ellAm kaNNan” (krishNa is everything for me). nammAzhwAr‘s divine feet are always mother, father, women [spouse], children, great wealth and everything else (that is not mentioned here) for [me and] my descendants. I worship and bow down with my head at the two divine feet of such AzhWAr, who is the leader and the head of our [vaishNava] clan, who is decorated with magizha flowers and is having SrIvaishNavaSrI (wealth of kainkaryam). mAthA – praying by doing penance etc., for the pregnancy, bearing great pains for pregnancy, keeping the foetus in her womb for ten months, experiencing great suffering during delivery, taking care in the toddler stage with great patience, bearing the harsh words of the child once he/she grows up, without leaving him, always looking to fulfil the child’s desires – AzhwAr is like such a caring mother doing [spiritual] favours. pithA – While the mother is the one who carried the child, it was the father who planted the seed in her to start with, and is the eternal well-wisher. AzhwAr is like such a father. yuvathaya: – The damsels who are dear to him even more than the mother and father – like them AzhwAr is very pleasing to the heart. thanayA: – The son who was given birth at the cost of her youth, the one who gives joy during his childhood, one who protects after maturing and the one who helps for the next life to facilitate avoiding the hell named “puth” (by doing virtuous rites etc). AzhwAr is like such a dear son. vibhUthi: – As none of these is considered worthy when there is no wealth, AzhwAr is like the desirable wealth which makes everything worthy. sarvam – Those other pleasure-giving aspects which are not mentioned here. yadhEva – By the exclusivity in “Eva”, it is implied unlike AzhwAr who is focussed exclusively on emperumAn as said in thiruvAimozhi 5.1.8 “sElEy kaNNiyar” (fish-eyed damsels etc everything is emperumAn for me), ALavandhAr is exclusively focussed on AzhwAr [even discarding emperumAn]. niyamEna – Always. Even while going to emperumAn, it is only due to emperumAn being dear to AzhwAr and not due to any other reason. madhanvayAnAm – For descendants by birth and knowledge as said in bhOja champu kishkinthA kANdam 10 “vidhyayA janmanA vA” (hanumAn who is a son of sUrya and vAyu by acquiring knowledge and birth respectively). Adhyasya – being the first and foremost AchArya for vaidhika descendants (followers of vEdham). na: kulapathE: – Like a woman would follow her husband’s clan, ALavandhAr is declaring AzhwAr to be the gOthra (heritage) and rishi (presiding sage of the family). 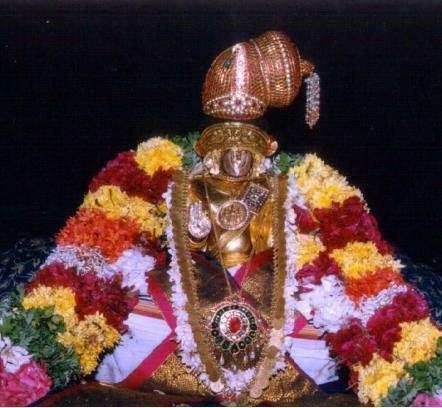 vakuLAbhirAmam – the divine feet which are decorated with the divine magizham flower. This explains the enjoyability of the divine feet due to its fragrance. It is differentiating them from the divine feet of emperumAn which has the fragrance of thiruththuzhAy (thuLasi) as said in thiruvAimozhi 4.2.2 “nalladi mElaNi nARu thuzhAy“. SrImath – always together with SrIvaishNavaSrI (wealth of kainkaryam). Being close to bhagavAn is explained as wealth as in SrI rAmAyaNam yudhdha kANdam 16.17 “anthariksha gathas SrImAn” (SrI vibhIshaNAzhwAn, the most wealthy person who has started his airborne journey towards SrI rAma), vishNu dharmam 68th chapter “sathu nAgavaraS SrImAn” (that gajEndhrAzhwAn is endowed with wealth of kainkaryam) and SrI rAmAyaNam bAla kANdam 1.18.29 “lakshmaNO lakshmI sampanna:” (lakshmaNa who is endowed with kainkarya SrI). Also explained as ALavandhAr saying “nammAzhwAr who has the wealth which is the origin for my wealth”. thath angri yugaLam – One can only say “that pair of divine feet” and cannot speak comprehensively about them. yugaLam – having the beauty of being together. praNamAmi mUrdhnA – On thinking about AzhwAr’s divine feet, he cannot simply say “nama:” (salutations) and stop with that; he immediately places his head on AzhwAr’s divine feet. With this, it is established that, for the mumukshus (those desiring for liberation), those who are the upakAraka (benefactors) are to be shown servitude to and to be praised. How can there be two lords for some one [i.e., how can one declare bhagavAn (lord) and bhAgavatha (bhagavAn’s devotee) both as masters]? As two masters are identified in mImAmsA, one for yAgam (sacrifice) and another for purOdASa (havis – offering), bhagavAn is the pradhAna SEshi (primary lord/master) and thadhIya (devotees) are dhvAra SEshi (masters/lords who open the doors to bhagavAn). Alternatively – bhagavAn is nirupAdhika SEshi (unconditional lord – he is naturally connected to every entity) and bhAgavatha SEshathvam (servitude towards bhAgavathas (devotees)) is sOpAdhika (conditional) due to the relationship of theirs with bhagavAn. He highlights these to indicate that the gyAnam, bhakthi etc which facilitate the commencement of his sthOthram, are wealth presented by his grandfather (ancestors). In the first three SlOkams, ALavandhAr explained periya mudhaliyAr’s (nAthamunigaL) predominant gyAnam (knowledge) and bhakthi (devotion); in the fourth SlOkam, he explained that such knowledge and devotion are in line with vEdham [and vaidhikas]; in the fifth SlOkam, he says that he got this knowledge [and devotion] by the grace of AzhwAr. This entry was posted in Other, sthOthra rathnam on December 18, 2016 by Sarathy Thothathri.